"Starbright Holidays - An Intel Collaboration" Gives New Meaning to "Wishing Upon a Star"
This holiday season, guests at Disney Springs – the shopping, dining and entertainment district of Walt Disney World Resort – will get a chance to see Disney and Intel exploring remarkable new technology as hundreds of lighted show drones take to the nighttime sky in "Starbright Holidays – An Intel Collaboration." The first-of-its-kind light show featuring 300 Intel® Shooting Star™ show drones invites guests to gaze skyward and make a special wish this holiday season. The synchronized choreography of the new Intel Shooting Star drones is set to a specially orchestrated arrangement of classic holiday music. In the nostalgic and stirring medley, Disney Springs guests can listen for a few bars of classic Disney melodies. "We are thrilled to share an experience as innovative and unique as Disney Springs," Keith Bradford, Vice President of Disney Springs, said. "'Starbright Holidays' is a wonderful surprise and delight moment for guests as they enjoy an evening of world-class shopping, dining and entertainment here at Disney Springs." Jon Snoddy, Studio Executive with Walt Disney Imagineering R&D, said, "At Disney, we are always looking for innovative ways to tell stories and create unexpected experiences. We're excited to invite guests to watch as we explore the possibilities of this remarkable new technology." 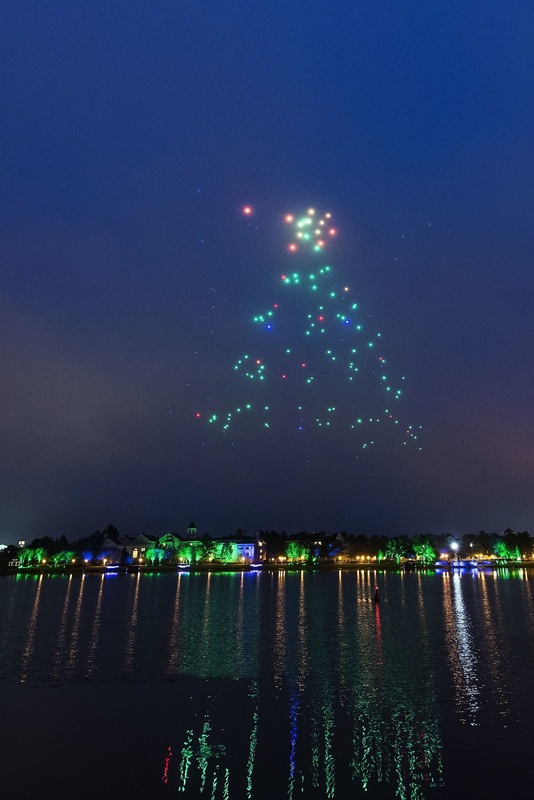 "Starbright Holidays - An Intel Collaboration" marks the first time in the United States 300 show drones have flown at one time. At 280g, the Intel Shooting Star drone weighs less than a volleyball, and features built-in LED lights that can create more than four billion color combinations. "We are excited to work with Walt Disney Imagineering to bring a fresh and innovative approach to its world-renowned light shows," Senior Vice President and General Manager of Intel's New Technology Group, Josh Walden said. "Together, we worked to tackle the new frontier of entertainment, picturing the sky as our canvas, and flying lights as ink." "Starbright Holidays - An Intel Collaboration" will join other holiday enhancements at Disney Springs, including a brand-new Christmas Tree Trail, special seasonal entertainment, meet and greets with Santa, and festive decor throughout all four neighborhoods – Town Center, The Landing, West Side and Marketplace. Disney Springs is a one-of-a-kind Disney experience, treating guests by day and night to great dining, shopping and entertainment amid beautiful open-air promenades, flowing springs and waterfront charm. Offering an air of sophisticated grace and design that harkens to Florida's waterfront towns at the turn-of-the-century, Disney Springs is home to four distinct, outdoor neighborhoods: The Landing, Town Center, Marketplace and West Side. Nearing completion in 2016, Disney Springs has been undergoing the largest expansion in its history to double the number of shops, restaurants and other venues for guests to explore, which will result in more than 150 establishments. Disney Springs is part of Walt Disney World Resort, the number one family vacation destination in the world, located in Lake Buena Vista, Fla.